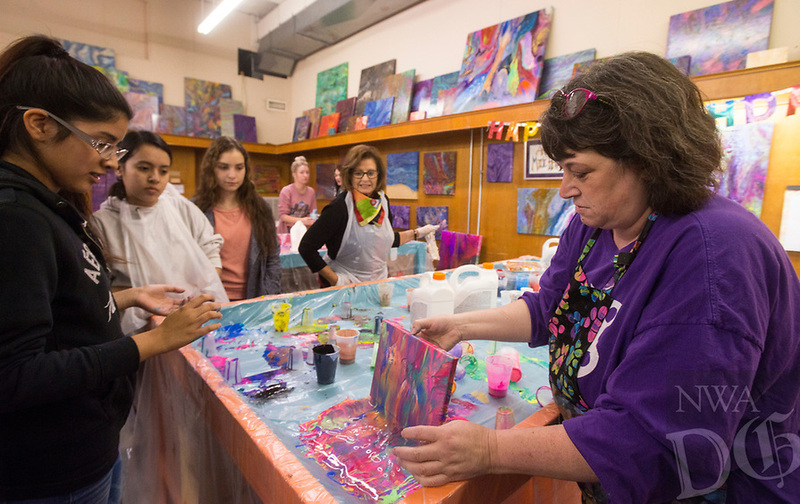 Marie Haley (right) of Art & Soul Studios NWA teaches a fluid art class for the Rogers Heritage High School chapter of Family, Career and Community Leaders of America Thursday, Nov. 8, 2018, at Rogers Experimental House during the 'Light Up the Night!' one year anniversary Art on the Bricks art walk in downtown Rogers. More than 25 artists and musicians opened pop-up galleries selling their artwork at downtown shops and restaurants. Go Downtown Rogers hosts the walks on the second Thursday of each month.